Polish off the fall staples but add some new pieces to the mix. This topper gives your style the workplace flow it needs but makes for a structured and flattering must-have on nights and weekends too. Being and apple shaped woman... it's amazing to find clothing that works on my body! 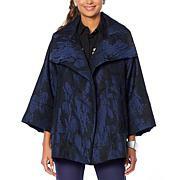 !This is an wonderful jacket that works so well for business or casual wear - great with skirts and pants. The fabric is comfortable and care is easy!! And it travels great too.Does not hug you... instead drapes around your body. Found this to be PERFECT for work - fabric is super stretchy and totally comfortable while still looking crisp and professional. HIGHLY recommend! Thank you Marla! I bought all 4 to match the crepe pants! This is an all season jacket. Will have lots of fun mixing and matching this blazer! Love you Marla! I wear nothing but your line! Fabric feels cold. Not a good fabric to wear in the winter. Liked the style, loved the pockets, but the feel of the fabric made this a return for me. Wish you would make this style in Drama Kimono fabric. I bought this to update my travel wardrobe but, unfortunately, I don't care for the fabric. It's heavy and wrinkles = not a good traveler. I also think the fabric feels weirdly clammy. I hope Marla goes back to some of her original knit fabrics. This ran a little bit large.